The important part first: BioGoji, the Godzilla suit featured in Godzilla vs. Biollante, is my all-time favorite design of the iconic creature. It's not flawless - like all of the VS Series Godzillas, it has chunky thighs that suggest that too much devouring nuclear sites and not enough time jogging is taking its toll (but hey, he was in his 40s at this point, cut him some slack). Though the flipside of that is that it's far less thigh-heavy than any of its successors in the 1990s. Anyway, the thighs aren't the point: what makes this the Godzilla of Godzillas for me is the face, an exquisite piece of monster design that stretches out the snub snout of the last two suits, thickens his brow to make him look truly mean, gives him dark brown eyes that turn to jet black spots in the night scenes, sharp little horn-like ears, and best of all, gives him a beautifully-detailed double row of fangs. It's not the most lizard-like Godzilla; it is, though, the most demonic, the one that feels most like some nightmare creature out of Japanese mythology. Which Godzilla is, after all. And I have gotten that far without even mentioning the dorsal spines, which are just about the perfect proportion and weight, though they do have a bad tendency to flop about. I will further point out that my adoration of the vs. Biollante suit has not, to this point, been contingent upon ever having seen the movie in which he resides; in the interest of disclosure, I'll admit now rather than later that while I came to this Godzillathon having seen a commanding majority of the first run of Godzilla movies, I hadn't even seen half of the VS series. So a lot of this will be new, confusing territory for me to mine. For example: I had no expectation that vs. Biollante would be so firmly in continuity with the previous film, The Return of Godzilla, links between films only being a tertiary concern in the '60s and '70s films. But there you have it. The film opens in 1984, days or even hours after the events of that series re-start, with a team of scientists hunting through the rubble of Godzilla's rampage to find any physical remains of the monster for studying purposes. They do indeed find some skin fragments, and this kicks off all the plotlines in a movie whose contribution to the franchise's generally eco-friendly moral tales, also catching me off guard, is of a vigorously anti-genetic testing nature. Contesting for a sample of Godzilla cells, wee have, at a minimum, the evil American corporation Bio-Major, the good Japanese government, and the morally ambiguous Republic of Saradia, a Middle-Eastern oil kingdom with a science program led by Japanese scientist Dr. Shiragami Genshiro (Takahashi Koji), attempting to create a new super-wheat using Godzilla DNA, to create a crop that can grow in the harsh Saradian desert. The film's prologue finds Bio-Major attacking the Saradian lab and, in the process, killing Shiragami's daughter Erika (Sawaguchi Yasuko), leaving the good doctor so distraught that he might do anything. And boy, does he ever. The plot than skips ahead to 1989 - the year of the film's release - to find Shiragami having sworn off all Godzilla-related research, with the Japanese government having instituted multiple anti-Godzilla defense contingencies, including the construction of a new Super X2, the successor to the fighter jet that did such a good job of subduing Godzilla last time (the new vessel, which looks kind of like a flying electric shaver, doesn't fare nearly as well when it finally sees action), a psychic research center with a program funded by a certain Okochi Seikun (Kaneda Ryunosuke), hoping to use psychically gifted young people as an early warning system and possibly an anti-Godzilla weapon. And last, research is being done with the Godzilla cells, in the hope of creating a working Anti-Nuclear Energy Bacteria, organisms that devour and render inert radioactive material (the implication, I believe, is that this was conceived as an nuclear waste disposal project, and only retrofitted into a defense weapon when Godzilla's return becomes imminent). There's a fourth line of defense left, though nobody realises it yet. The team working on the ANEB needs the help of Dr. Shiragami if they're going to go any farther, and he has a single request: some of Godzilla's genetic material for his own experiments. The mad, grieving doctor wants the introduce the monster's cells into the Biollante project he's been working on, which turns out to be a super-hardy rose which has been hybridised with Erika's DNA. This means, of course, that we now have a plant-human-Godzilla chimera on our hands, and in hardly any time at all, it has turned into a gigantic, towering rose bush with mouth-like growths at the end of its stems. This abomination is called out as such by Kirishima Kazuhito (Mitamura Kunihiko), a geneticist going through a moral crisis, the boyfriend of Okochi's daughter Asuka (Tanaka Yoshiko), and the closest thing we have to a protagonist, but it ends up being a good Frankensteinian perversion, not a wicked one. That's an unbelievable amount of plot to not even get us to the point where Godzilla is freed from its volcanic tomb by Bio-Major, whereupon the film settles into a much more comfortable, straightforward daikaiju eiga on the classic model. 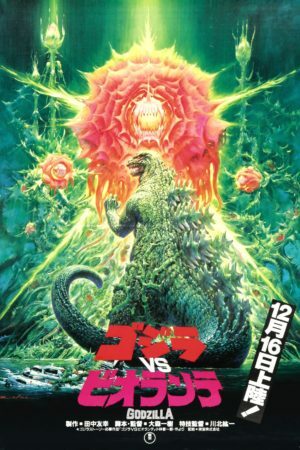 Godzilla destroys Biollante, rampages through Osaka, and is in turn smacked around by a mutated, revived version of Biollante. There's some convoluted business involving all of the human attempts to stop the monster throughout, but you don't need a roadmap to follow it, as in the first half of the movie. I am uncertain if this messy, discursive way of telling the story benefits Godzilla vs. Biollante or is a strike against it: there's something charming in how the script recalls one of Fukuda Jun's "Godzilla-as-Bond-movie" exercises, only played entirely serious and straight. At the same time, it's really not worth the mental work it takes to keep track of it; the numerous characters littered throughout (and I haven't even mentioned all of the important ones) are all pretty bland and anonymous, reduced to one or two easy-to-remember character traits. And the mish-mash of scientific terms and concepts puked out of the course of the movie is as idiotic as anything you'd hope to find in a cheapie mad scientist film from the '50s. The story was the result of a contest Toho held to invite fans to pitch the new Godzilla picture; it was won by dentist Kobayashi Shinichiro, whose ideas were changed into a very different form by writer-director Ohmori Kazuki, who for his pains would be rewarded with writing duties on no fewer than three more Godzilla films in the subsequent decade. Whoever came up with every individual idea, it's a complicated swamp of narrative, and the payoff just isn't there. And yet, while watching it, that doesn't really seem to be a problem. Partially this is because Ohmori the director is much more gifted than Ohmori the writer; Godzilla vs. Biollante is an astonshingly striking movie, visually, with some truly beautiful shots and moments. There is a particular sequence in which all of the children at the Okochi research institute excitedly share the drawings they made, based on their dreams; the shot of them all holding up crude crayon pictures of Godzilla breathing down fiery destruction, accompanied by the chorus of enthusiastic kids cheering for their handiwork, is maybe the most terrifying single image in any Godzilla film since the very first one. There's dramatic tension to the camera angles and beauty in the lighting found in not one instant of The Return of Godzilla; Ohmori might have been a bit clumsy at telling a story, but he and cinematographer Kato Yudai sure knew how to communicate thoughts and feelings visually. The film also boasts one of the most intriguing, though not thus one of the best, scores in the Godzilla franchise. Composed by Sugiyama Koichi, the music includes frequent quotations from the great themes and motifs composed by Ifukube Akira in the series' heyday, and that adds a real sense of grandeur and weight to the proceedings; the '80s rock orchestrations of those same themes are peculiar as all hell, but Sugiyama finds a way to make it work. His new material , though by no means as effective as what he purloins, builds on Ifukube in generally successful and compelling ways. I'd never listen to it alone - it's far too dated in far too many ways - but the music creates a very particular mood that isn't replicated anywhere else in the franchise. But, above all else, what makes the movie work is the monster action. Godzilla vs. Biollante has some of the all-time best effects work in the annals of daikaiju eiga: if I have one complaint, it's that the models of Osaka aren't nearly as interesting as the Tokyo seen in The Return of Godzilla, or the highest-budget work from the 1960s. This was the first film with effects directed by Kawakita Koichi, who served as Nakano Teruyoshi's assistant in the previous film and had worked under Tsuburaya Eiji in the '60s; a strong background that shows up onscreen. Not only is the new Godzilla suit a masterpiece, both versions of Biollante are absolutely terrific, with the second and more mobile and monstrous standing out as one of the best of all Toho kaiju. The fight itself is a gorgeous piece of action filmmaking, with dark lighting to add to the drama and some really impressive, shockingly violent choreography (the shot of a spike vine plunging through Godzilla's hand, which then gushes green blood, is truly horrifying in the best way). It's a damn shame that the film's relative failure at the box office was blamed on the monster, who then never re-appeared; Biollante's particular characteristics inspired the filmmaker like few people were ever inspired in this genre, and for all the film's curiously plodding story, it's impossible not to forgive all sins during those glorious moments when it appears, a nightmare of teeth and leaves that is imaginative and unique like few movie monsters ever have been.